Flying Squirrels "Attack!" Shirt for Women and Men. 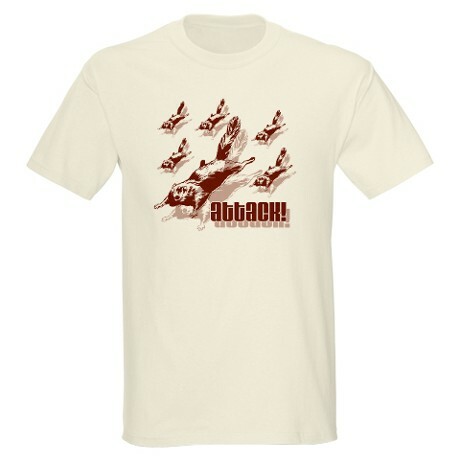 From the artist: "A diving formation of flying squirrels and their "attack!" battle-cry. They're plotting against us from within the trees!" You can buy this shirt here. This well-executed design of flying squirrels in formation hints at the "can't trust squirrels" meme. Those devious little critters are planning against us! It also appeals to the "war against squirrels" mindset among avid bird lovers who struggle to keep squirrels out of their bird feeders. You thought the primeval struggle was man versus nature ... but now you know: it's man versus squirrel. Great for a chuckle, or to show your solidarity with flying squirrels and honey gliders. This fine squirrel shirt is available in 15 different styles and a variety of colors -- you can't go wrong with that.